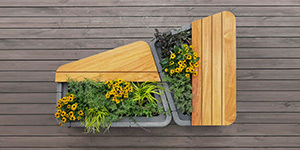 From the single common base moulding, the various combinations of seating and planter allow for 14 unique modules. 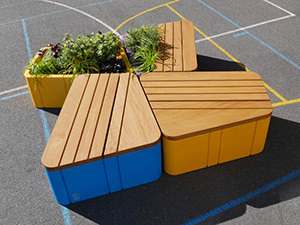 These are made up of the base module in standard and reverse format which can also be flipped, whole or part timber platforms with either longitudinal or transverse timbers. The full seating platform comfortably accommodates 3-4 adults, with the half platform generally accommodating 2 adults. 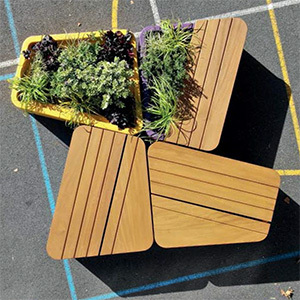 When used in a child-centric location, they will offer an increased seating capacity. 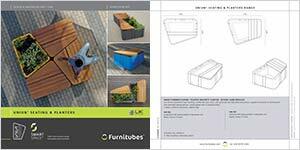 The base unit is made from rotationally-moulded LLDPE and available in a wide range of colours. They are all through-colours, meaning scuffs will not expose any base material of a different colour. The LLDPE moulding is fully recyclable, and a fully recycled version is also available in a black colourway. There is a range of mottled / stone effect colours, flat natural colours and also vibrant bright colours, which are particularly popular in school environments.